Simple really – it's a quick and easy way to see how alkaline or acid you are. Many believe, the more acid is in the body - the weaker it will perform. Robert Young* lists fatigue, allergies, overweight & mood disorders as some of the most common problems of overacidity. One of the simplest changes with the biggest effect is to ensure that you drink 2-3 litres of alkaline water every day. Alkaline water has a higher pH and is enriched with minerals to give you an increased sense of well-being and allowing a natural health improvement. The pH of water can easily by increased by using pH drops. Eating lots of fresh leafy greens & vegetables can also make a real difference to your body's pH. Supplements of Green Drinks & liquid Chlorophyll are a great addition to the daily food intake, as they contain the best from vegetables, herbs, young grasses and leafy greens. Alkaline Minerals & Salts can help to get rid of acids in the deep tissue layers of the body. They also include vital minerals. 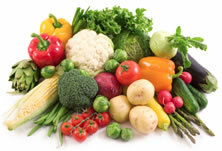 Click here to find out more about Acid & Alkaline Foods. In order to gain full insight into the pH of your body fluids, it is recommended to test both - urine and saliva. Test the pH at different times of the day and record the readings over a longer period of time to gain a bigger picture of your progress, rather than reading each in isolation. Try and test under the same conditions each day, ie the first and second urine as well as the saliva first thing in the morning. Our SimplexHealth pH test strips contain a 30-day chart to record the readings so changes can be tracked. Wait 2 hours after eating, drinking or brushing your teeth. Try to fill your mouth with saliva and then swallow. This helps remove any acidic bacteria that might be lurking. Do not rinse your mouth with anything else as you will simply record the pH of the water/liquid you have just used. Put some saliva on a spoon and then test the pH by dipping the strip into it. Non-bubble saliva works best. Make sure both pads on the test strip are sufficiently covered in liquid, remove and then wait 15 seconds (or the time indicated on the pack instructions). Match the colour reading against the indicator chart in the pH test strips' packaging. Discard the used pH test strip. The body will engage in different processes to remove acid waste from the body throughout the day. This can depend on activity, stress levels and, of course, diet. This may lead to fluctuations of the readings throughout the day. Therefore, we suggest to record the test results over a longer period of time, ideally 30 days. The first urine of the day is usually slightly more acidic than normal, therefore test the first & second urine of the day. (Please note, some authors recommend not using the first urine of the day at all**). We recommend to track both over time to see changes. To test, place the pH test strip in the urine stream (mid-stream) until both pads on the test strip are sufficiently covered in liquid, then remove. Compare colour change to colour chart. Discard the used pH test strip. Try and complete the colour matching as soon as possible as the colours are not stable and can change further. The SimplexHealth pH test strips have the special double colour indicator method for testing narrow pH ranges. This method gives the clearest and most accurate indication. Compare the colour of both pads against the indicator chart on the packaging. Sometimes, the readings can be influenced by other substances present in urine or saliva, such as medicine, neutral salt, protein, colloid, alkaloid, organic solvent (like alcohol). In this case, it is better to use the reading of the top pad only (the one furthest away from the handle). In these instances, the top pad is more stable at performance than the lower pad. Why can there be fluctuations in the readings? Diet & lifestyle (stress, sport etc) can influence the pH. There can be a difference between your urine and saliva readings, because a) your mouth is more likely to contain acidic bacteria throughout the day and b) because your urine is more of a reflection of the processes the body is undertaking to remove acid from the body. It is therefore recommended, to test urine as well as saliva under the same conditions each day over a period of time. This will give a bigger picture of your progress rather than concentrating on each reading in isolation. The SimplexHealth pH test strips contain a 30-day chart, where you can easily record the readings. 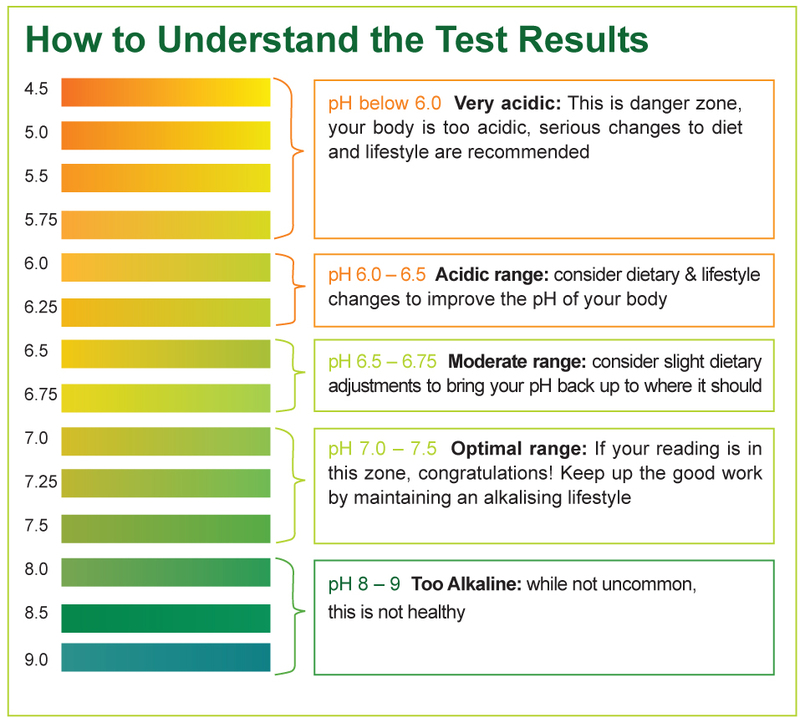 The reading of the pH strip will give you an indication of how acid or alkaline you are. A reading of anywhere 7.0 to 7.5 is excellent for saliva as the saliva tends to be slightly more acidic. For urine, a slightly higher pH level of 7+ is good, but remember that due to the kidney’s processing of toxins, the first urine can be more acidic. Don't worry, things can be done if you are too acidic. Making alterations to your diet and supplementing your diet with alkalising elements will help to bring the pH back to where it should be. Seek help of a trained nutitionist or health professional. An analysis of the regular food we eat determines the proportion of acidifying and alkalising foods. A good alkaline diet should consist of 80% alkaline foods and 20% acidic foods - don't forget to count drinks too! Follow our free Guide to Acid and Alkaline Foods to help you improve or maintain the pH of your body. Testing your pH on a daily basis is a fantastic way to see how you are doing and what effect any change in diet is having on your body. By regularly using pH test strips, average reading can be recorded over a period of time. Further Information: To learn more about the Alkaline Diet click here.